If a batch of bread has too much flour when it makes its way to the factory assembly line, the dough is a no-go. But what is a profitable company to do when it’s left with unsellable food waste? 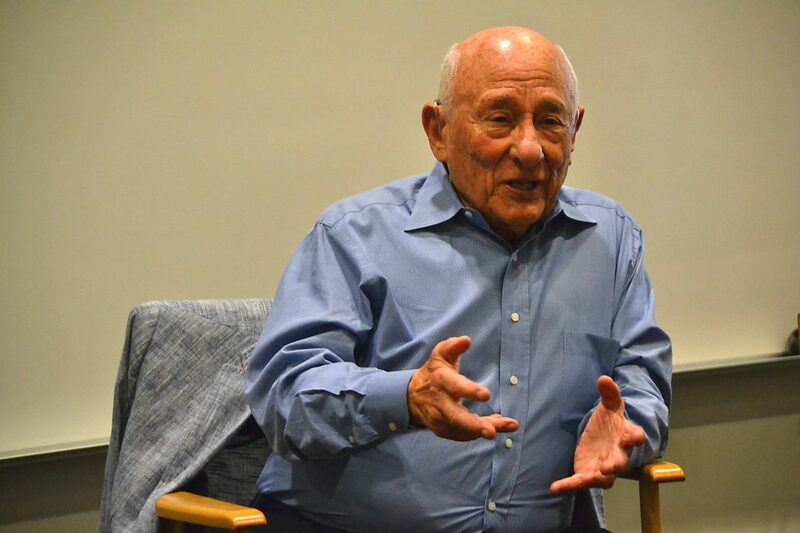 At an Oct. 18 lecture, Meyer Luskin explained the idea and logistics behind the successful national food recovery business for which he’s worked over 50 years. 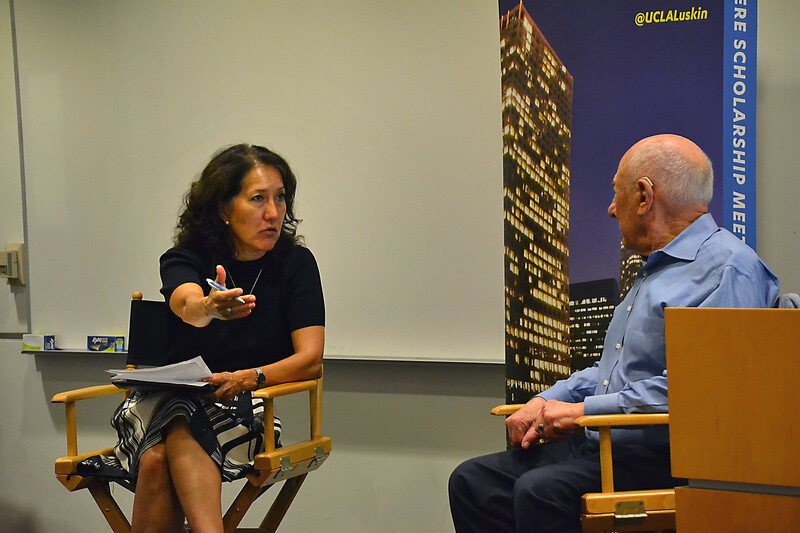 In conversation with Urban Planning lecturer Paula Daniels, founder of the LA Food Policy Council, Luskin said he began to think critically about food conservation early in life. 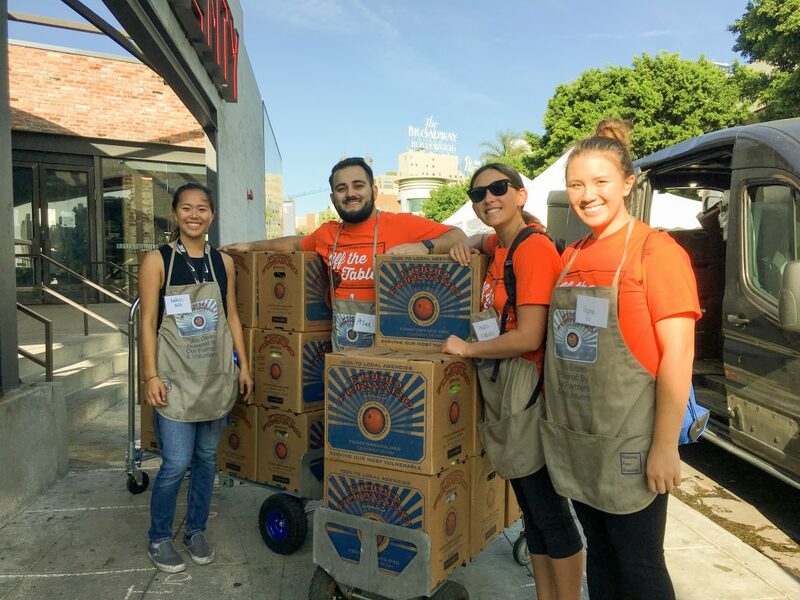 Luskin has made reducing food waste a centerpiece of his career. As chairman and chief executive officer of Scope Industries, a company he joined in 1961 that specializes in food recycling, Luskin led the expansion of an operation geared at turning food production waste into animal feed. 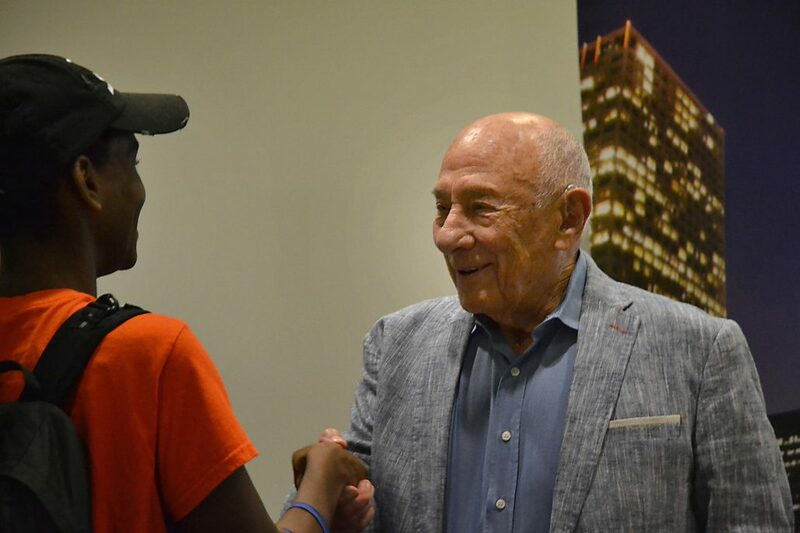 The concept is simple, Luskin explained to the 50-plus students, faculty and community members who attended the afternoon lecture. 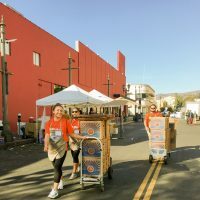 When a factory produces a batch of food that doesn’t meet its retail standards, assembly-line workers will place undesirable product into bins, provided by Luskin’s company. The bins, which often contain complete products — including packaging and other inedible materials — are transported to processing plants where the grain-based food matter is separated, ground and dried to rid it of moisture, ensuring the food will survive the shipping process. The finished product is then sold to farmers to be used as livestock feed. Luskin brought in a mason jar filled to the brim with a treated batch of animal feed to show the class. “This may have once been a huge mound of garbage,” he said, explaining that sometimes assembly-line workers treat collection bins as trash receptacles. “This looks like something we could eat ourselves!” Daniels said, examining the jar. Even though the finished product might actually be fit for human consumption, people are not actually allowed to eat it per Food and Drug Administration Standards, Luskin informed attendees. “This product has been on the floor, most of the machinery is not stainless steel, but when it comes out of our dryer … we’ve killed every bug that you can imagine,” he said. Luskin’s company began with a single processing facility in 1962, handling 100,000 pounds of food per year. Today, the company has 17 plants across the country and recycles 2.6 billion pounds of food annually. Each ton of feed sells for about $120, or six cents per pound — allowing farmers to affordably feed livestock with grain products that might have otherwise been thrown away. 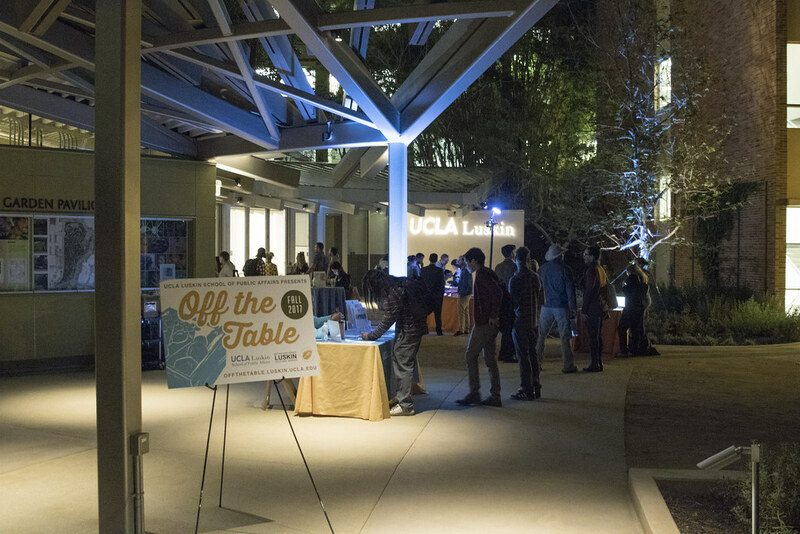 The lecture was the first speaker event of the Luskin School of Public Affairs’ ongoing “Off the Table” series of discussions, screenings and events aimed at educating the UCLA Luskin community about where our food comes from and how it can become more sustainable. 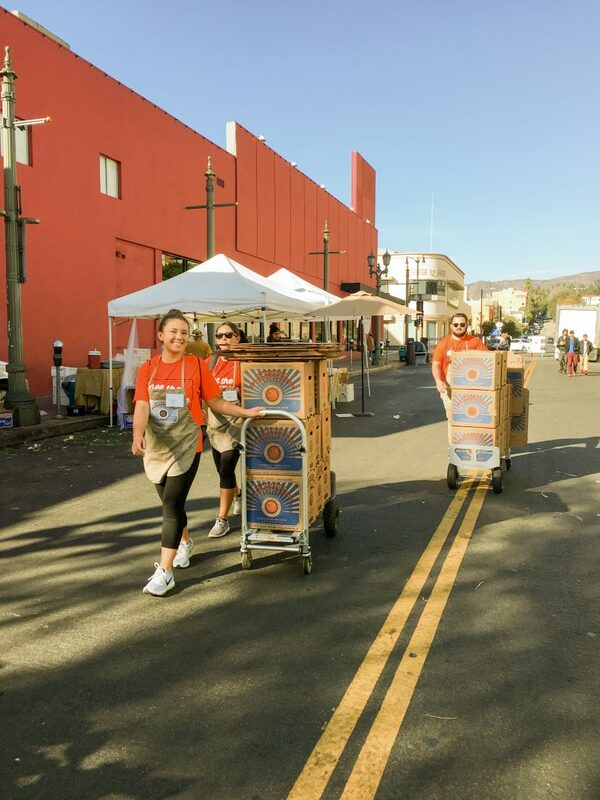 Among the themes addressed by “Off the Table” is the concept of food justice and responsibility to ensure the food that is produced does not end up in landfills — tying in neatly with the conversation about Luskin’s work and the challenge to prevent further food waste. 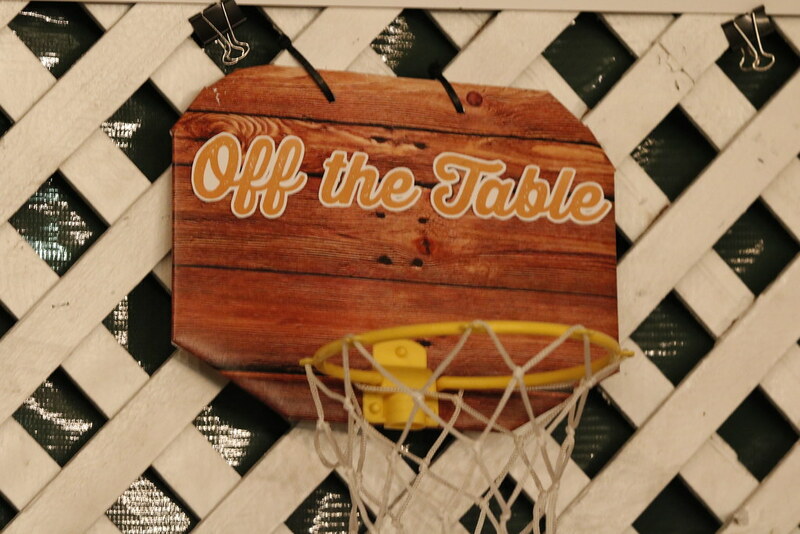 A full program of “Off the Table’ events can be found here. 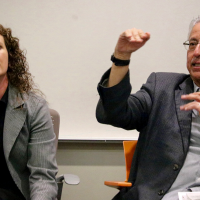 “Harvesting Change: Fostering Partnerships for Food Security” took place Oct. 26 at the Luskin School and featured a festival held on the 3rd Floor Commons of the Public Affairs Building. The event segued into a panel discussion hosted by Urban Planning alumna Jessica McBride MURP ’14, founder of Open Silo and project manager for three6ixty. Fatinah Darwish, a program manager at the L.A. County Department of Public Health, Nutrition and Physical Activity, talked about county efforts to reduce food insecurity by increasing inter-agency coordination among government, healthcare and non-profit organizations. 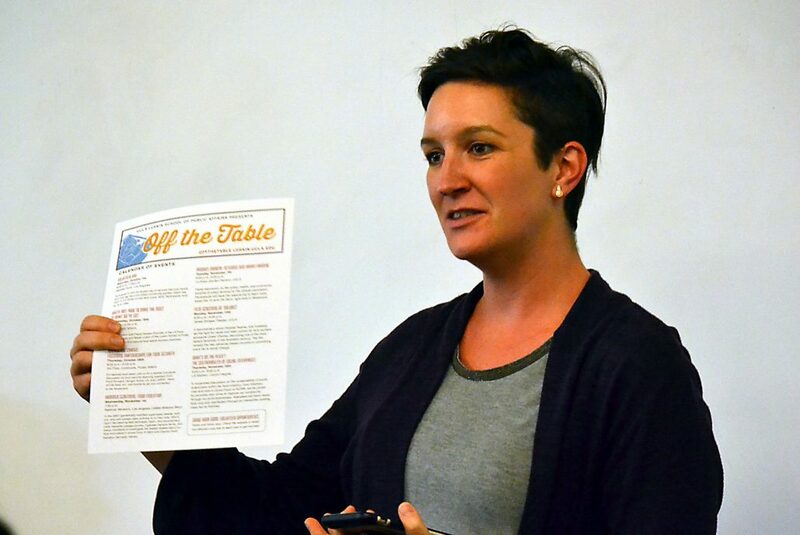 Mental health expert Rhea Holler, Ph.D., spoke about the shame and feelings of failure often experienced by people who are unable to afford food for themselves and their families. 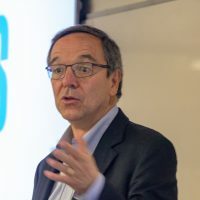 UCLA Luskin Senior Fellow Rick Nahmias, founder and executive director of Food Forward, talked about his organization’s history and its ongoing efforts to repurpose surplus food from fruit trees, farmers markets and other sources to provide hunger relief in Southern California. 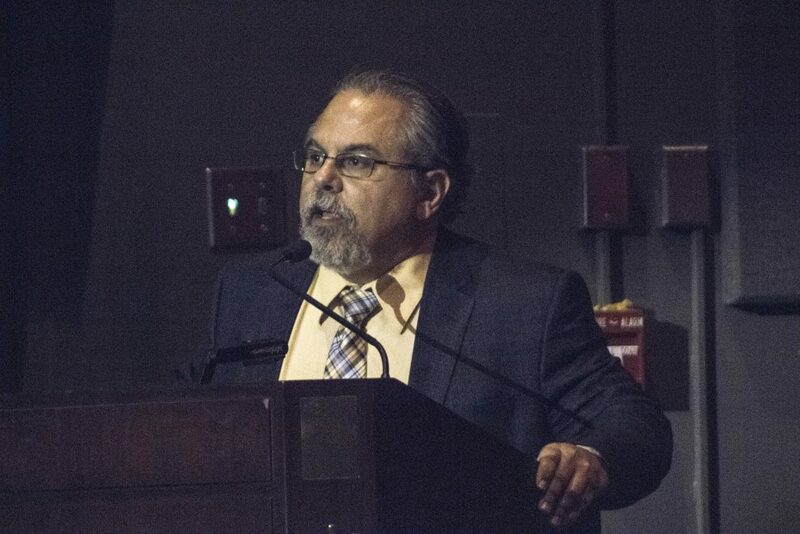 Attendees also heard from Frank Tamborello of Hunger Action LA, which is working to end hunger and promote healthy eating through a variety of advocacy, direct service and organizing efforts that benefit Los Angeles residents. Access a Flickr gallery from this event below. On Nov. 7, 2017, a panel discussion titled, “Breaking Bread: Community Building with Veterans and Farming,” focused attention on the community and health benefits of urban farming for the veteran population. The participants included moderator Kris Skinner, a retired Army captain and UCLA alumnus; physician Peter Capone-Newton MA ’09, PhD ’13 of the U.S. Department of Veterans Affairs; Mick Deluca, assistant vice chancellor, UCLA Campus Life; Jeremy Samson, a military veteran and urban farmer; and Julie Sardonia, program director for Veteran Farmers of America. A reception at La Kretz Garden Pavilion in the UCLA Botanical Gardens preceded the panel discussion, which focused on efforts to revitalize a 14-acre garden on the U.S. Veteran Affairs campus in West Los Angeles. The event was timed to coincide with other university activities in advance of this year’s Veterans Day holiday. Access a Flickr gallery from the event below. 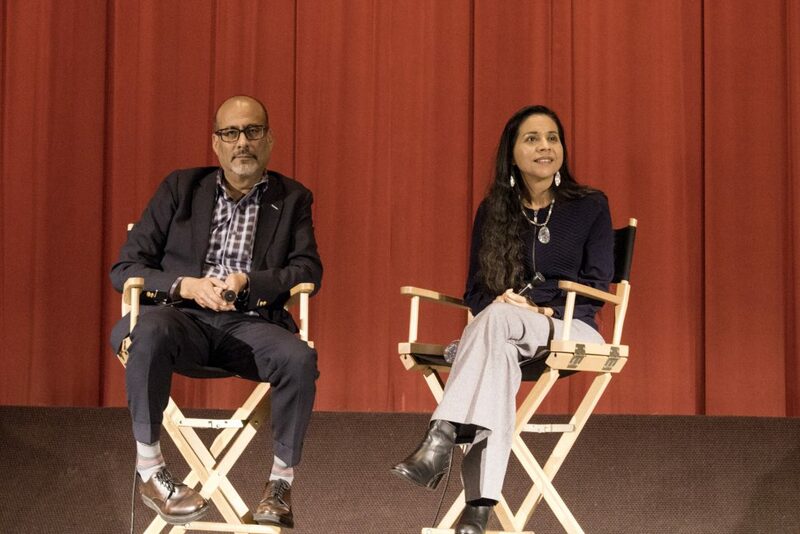 On Nov. 13, Maria Elena Chávez’s presence at the screening of “Dolores,” a documentary depicting the life and legacy of civil rights activist Dolores Huerta, sent a powerful message about generational activism and fostering change within minority communities. The political landscape of Huerta’s generation, where there were fights for basic human rights of farm workers, is not so different from today, Chávez said about her mother’s efforts. 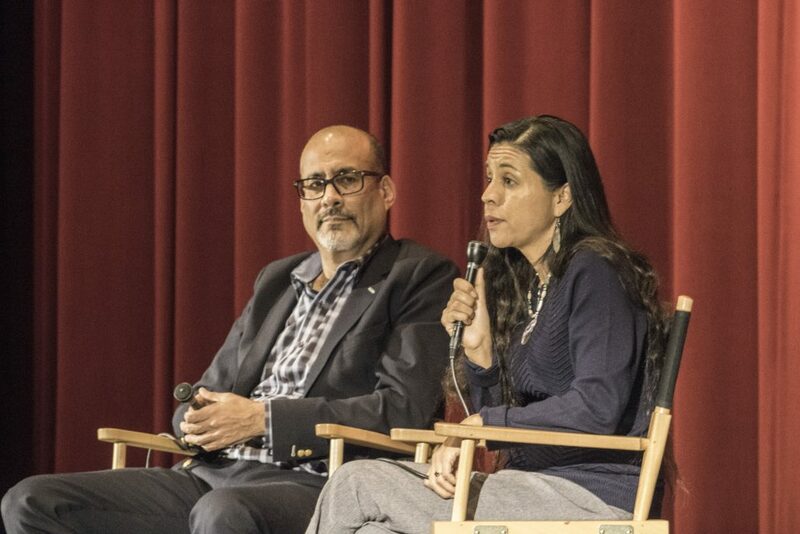 As the film depicts, marginalized immigrant farmworkers living in poverty were able to organize and fight for their rights, benefitting generations to come. Huerta, now 87, was at the heart of this movement, demanding respect, fair wages and access to clean water on the job. Chávez described her mother as “unstoppable” and “passionate” as she has continued to make an impact in her community after leaving the Unified Farm Workers Movement organization and creating the Dolores Huerta Foundation. 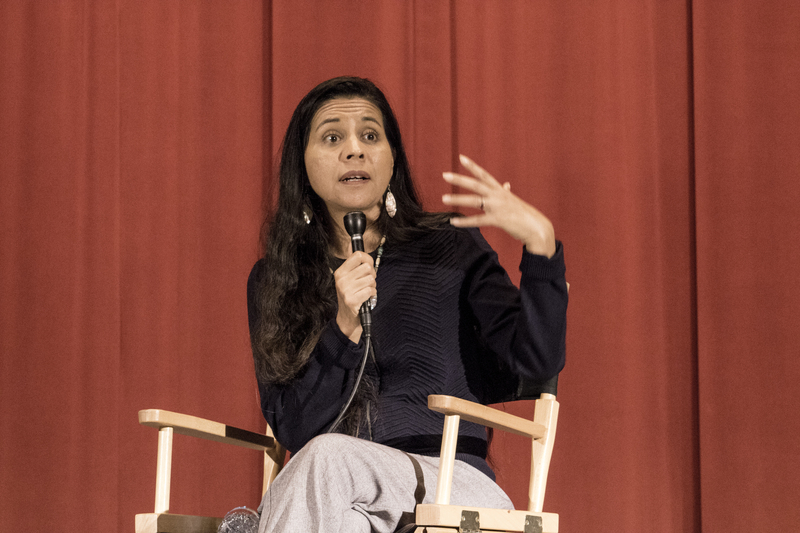 Chávez also discussed her mother’s impact on her life and professional choices as a political filmmaker and civil rights activist. 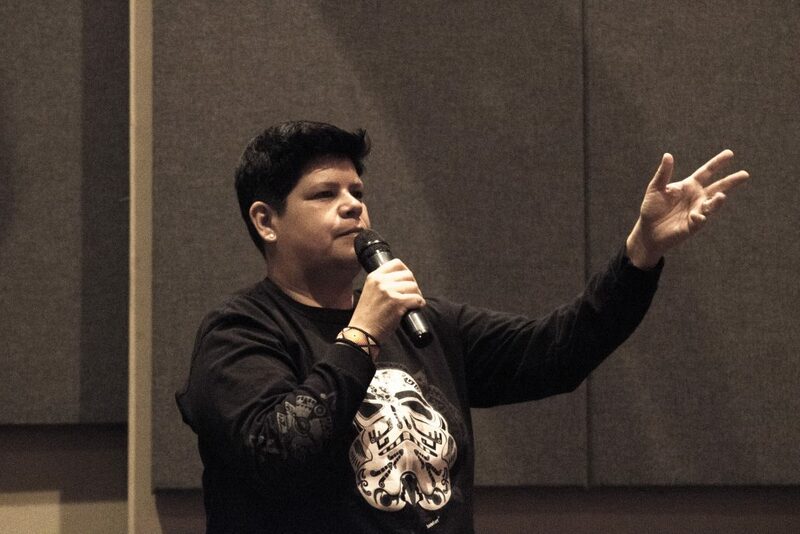 “It’s in my blood,” said Chávez, who is the daughter of Huerta and Richard Chavez, the brother of César Chávez. She also spoke of the challenges of growing up in a politically active family and adversities she faced because of her mother’s dedication to the civil rights movement while raising 11 children. 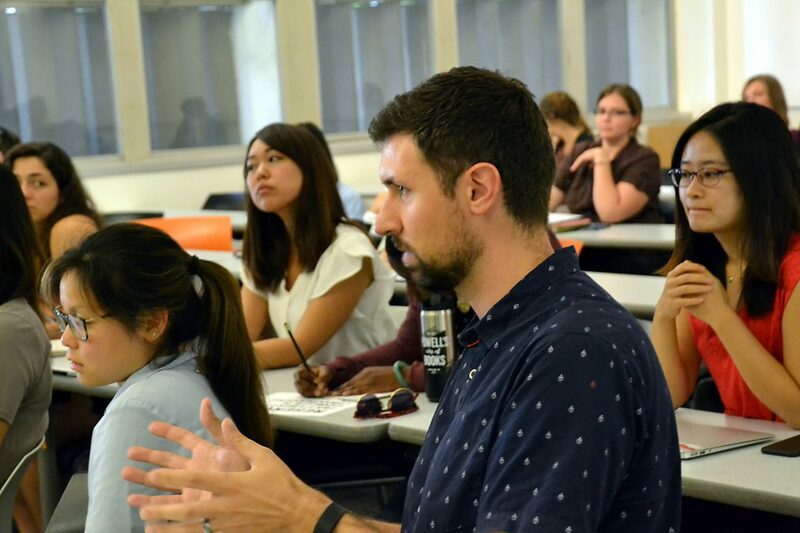 As first-year Master of Urban and Regional Planning students, Bianca Juarros and Esteban Doyle wanted to find meaningful ways to get involved with the UCLA campus community. 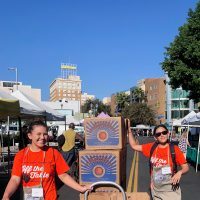 The Luskin Food Mentorship program provided a way for them to do just that, while also exploring interesting and relevant topics. 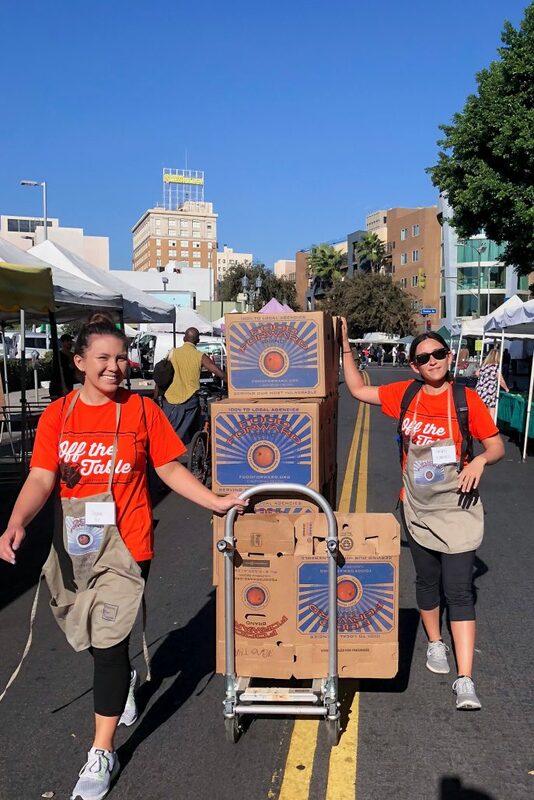 Read about their experience coordinating a volunteer event that brought UCLA students together on the Saturday before Thanksgiving at the L.A. 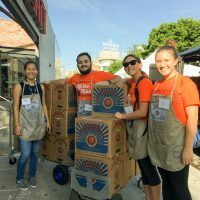 Kitchen to prepare food for community service organizations such as homeless shelters and senior centers. From left, Audree Hsu, a UCLA physiological science major with a Food Studies minor; Alex Salgado, first-year MURP student; Anna Kobara, first-year MURP student; Sophie Go, UCLA biochemistry major with a Food Studies minor. The UCLA Luskin School of Public Affairs and the UCLA Food Studies Graduate Certificate Program wrapped up its 10-week “Off the Table” series on urban agriculture, food security, and food policy with a moderated discussion on the sustainability of social enterprises within the food industry led by Evan Kleiman, chef and host of “Good Food” on KCRW. She was joined by panelists Anar Joshi of Everytable, Kaitlin Mogentale of Pulp Pantry, Nick Panepinto of L.A. Kitchen and Karla T. Vasquez of SalviSoul during a gathering on Nov. 30 at the L.A. Kitchen facility in Lincoln Heights near downtown Los Angeles. Among other topics, the speakers talked about their efforts to promote healthy eating among young people. “One of our most successful programs was cooking lessons for kids,” Vasquez said during the panel discussion. “We told them, ‘You can like something, love something, or hate it. But you have to make it. 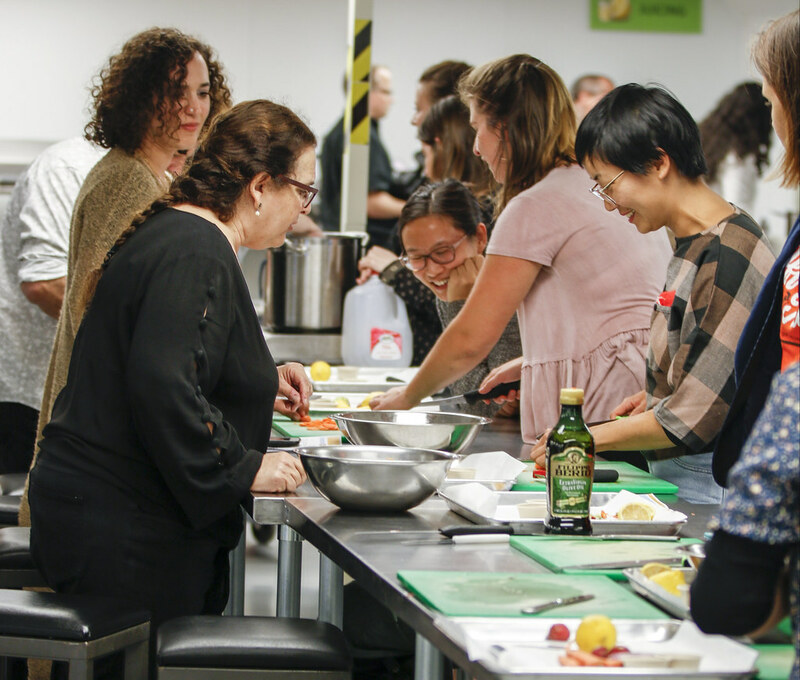 There’s so much food in the world, and you get to try it all!’” Afterward, attendees had a chance to do some cooking themselves, making a vegetarian ricotta carpaccio from scratch under Kleiman’s direction. Download the recipe. View a video of the panel discussion. Browse a Flickr album of images from the event below.